We were staying at hostel “Jo’s Place” and decided to ask there and lucky that we did as it turns out that the owners of the hostel are lifelong friends with one of the original guides (huaywash_aventura@hotmail.com) and his son, David, was staying/working at the hostel. He’d just finished his college course and was kicking around unemployed. Vicky (the joint owner) said we’d do well to get him out and about so they priced up the trek. David’s father was out of town but he could borrow the family business donkeys and take us on the Huayhuash! This meant a lot more work for us e.g. arranging stove, camping gear and it worked out much cheaper. 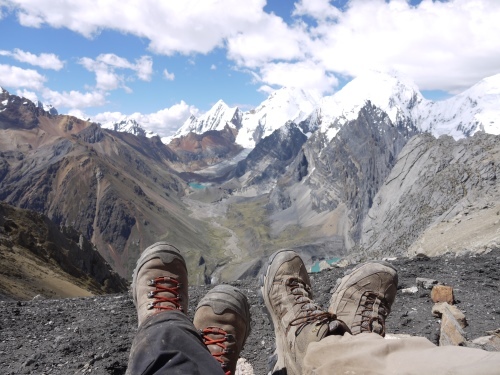 After a couple of days of the acclimatisation walks (I can’t recommend these enough – one they are beautiful and two you don’t want altitude sickness on your expensive trek..) we were ready. We took a day to buy food and gas. This turned out to be an ordeal. We’d already gone out and bought vegetables from the local market – David then took a look and took us to a supermarket to buy all manner of junk and sugary crap. He even tried to put 2kg of salt in the trolley and it took an awful lot of talking to get him down to a single giant bag of salt – they love the stuff in South America nearly as much as sugar. We hired a household gas cannister (requiring a hefty 80 soles deposit with a warning not to lose the receipt) and Jo’s Place supplied tent and roll mats. David headed off that afternoon as he had to pickup the donkeys from Chiquan and drive them to the start of the trek. He showed us where the bus station was, we bought tickets and we were set – for a 4am get up to get our 5am bus! We caught the bus from a small private bus terminal (4 soles by taxi) from the hostel at 4.30am leaving at 5am. We were warned the night before that luggage theft was common on the bus and we had to watch our bags closely… pretty difficult to do as we had two rucksacks, three huge sacks of supplies (one of which contained a fairly valuable gas canister) and, most annoyingly, a tray of sodding eggs. Before we set off I stood paranoid outside of the bus watching the luggage doors with some equally worried French guys who had some nice, expensive looking, lightweight gear and were going unguided for four days on a smaller loop. The bus was pretty comfortable and finally stopped in Chiquan for an hour for a, well needed, breakfast stop where we managed to completely confuse the café owner by ordering both coffee *and* porridge! As it turns out we found out that porridge is served more like a breakfast drink in Perú a cultural difference from our thick milky English version… a cultural experience we would force our abbierto to experience in reverse over the next ten days. After breakfast we left the the café to return to where the bus had been. The bus wasn’t there but we did find our, and everyone elses, bags left on the side of the street completely unattended. I went around the corner to find the French guys on their way back and reminded them off my earlier warning to watch their stuff. As they turned the corner their faces, as they saw their stuff dumped on the street, were a picture! The eggs had also thoughtfully been removed from the overhead compartment and place carefully on top of a sack. A different, slightly more knackered, smaller bus shortly arrived and took us most of the rest of the way. I suspect they save the suspension on their good bus as the next bit of road was unsealed with some tricky bends. We finally swapped to a 4×4 at Llamac for the last half an hour to Pocpa – it’s the same driver who takes you, there is a part of me that thinks he just likes to drive the 4×4. As we arrived David was waiting with the donkeys. We were pleased to see the donkeys looked very healthy with no scars and they seemed to really like David. After half an hour of reorganising bags and loading the very patient donkeys we set off. The path was mostly on the road which had a bit of mining traffic on it but was in a beautiful canyon. We arrived at the campsite at 1445hrs – this sounds early but after a 4.15AM get up was welcomed. The donkeys were posing next to the campsite sign. I wanted to take a photo and asked Charlotte to stand with them. At this point some farm dogs crowded around Charlotte with a small nice one running up to her. This is where disaster struck and our trek nearly ended. The big male dog must have been guarding the, in-season, female which she was looking at and went for Charlotte’s leg without warning. I’d just started to take a picture with Charlotte and the dogs and had to run at them. She got bit twice on the shin and calf before I could react and scare the dog off (as I run at it – it did first size me up before deciding against afters..). The first bite was very deep, we could see fat tissue in her leg and the shin bone! Luckily she had a basic first aid kit and we steri-stripped the wound to stop the bleeding. Now we had a decision to make.. head back for medical treatment or risk it and continue on but days away from a road and help. We had soup for dinner and decided to wait for the morning. The steri strips had worked well but we knew the wound needed properly cleaning. David told us there was a medical centre in the mining headquarters we’d passed the day before. He thought we could go there and be back for 10am and that we could see if we could do at least half of our second day but camp at a different site. We started walking the 4 or 5 km back down the road hoping to thumb a lift. A man finally stopped for us about two thirds of the way there and took us straight to the doctor. The doctor looked at Charlotte’s steri strip handiwork and initially didn’t want to disturb it until we insisted it needed cleaning. His opinion quickly changed when he removed them and soon Charlotte was having a local anaesthetic and three stitches. 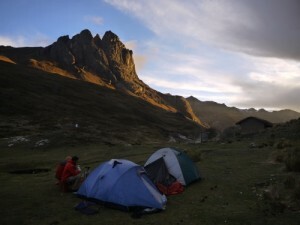 We walked back and arrived back at the campsite for 0955hrs.. not a bad guess by David who had prepared our pack lunches. Charlotte seemed to be able to walk without too much discomfort so we packed up and walked half the second day. We left the mining road and headed up a pass to the right of the campsite. The route up was quite steep and the donkeys soon overtook us. The clouds had come in bit we had a glimpse of a view. 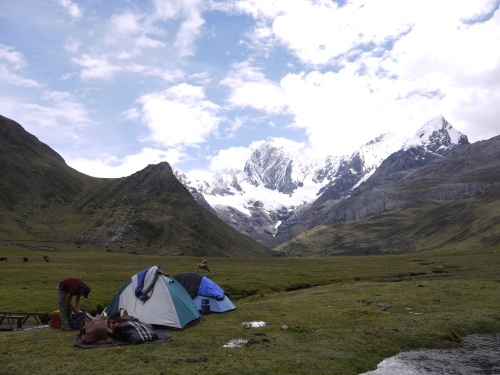 4 hours after leaving the campsite, including a stop for lunch, we made it to the very beautiful Laguna Mitucocha. With the dark clouds and moors like scenery it reminded us of the Lake District in England! It was raining most of the afternoon but stopped just enough for us to dive out of the tent and cook a stodgy dinner of pasta, soya and vegetables. Well we had to show David we wanted more than soup which had been dinner for day 1! Doing only what would be most people latter half of their second day we arrived at 1130am just before it started raining heavily. An afternoon in the tent followed (books and Spanish mp3 lessons came in handy). It stopped for twenty minutes which allows us to cook “comida rapido” pasta, soya and packet soup – delicious. An early, windy (the soya) night followed. A fairly leisurely day with 5-6 hours walking. We walked a bit extra off the route (head left off the high pass to the ridge) to take in a 360 view of the area. A lovely campsite (makes sense if this is the walk’s namesake) with a beautiful mountain backdrop was the reward after a long feeling downward tramp (it starts after you get to the lake). Watch out for the angry dogs just before the campsite! In season the campsite has a shop which David told us sells beer for 8 Soles – I think and hope that is the big ones! David had excitedly told us that he was going to catch trout for dinner and even asked how many I wanted! Unfortunately he only returned with one so he had to make do with our potato curry and rice! So far we’d not seen a single other person on the route – perhaps only handful of locals. David told us that he’d meet two hikers who were just ahead of us (we’d seen their footprints and suspiciously I’d also had to pick up a lot of sweet wrappers which looked fresh). We walked slowly and could see fresh snow on the peaks. We got to the lake which is dammed (it has a lower path which should be avoided if the water level is high) and thought we were nearly there. Turns out there is quite a bit to go but we arrived by 1200hrs. The thermal baths were lovely (following David’s lead we washed with soap before realising you probably shouldn’t) and, as the campsite owners were away on holiday, were free. There was a very hungry dog hanging around the camp who was grateful for our rice scraps – I just hope he doesn’t just rely on the owners and tourists for food as there was neither around! Through broken Spanish we taught David how to play Uno until the rain spoilt it. Luckily it stopped long enough to allow us to make chilli… which we tried to explain was a different word than the country before wondering if it was or not?! Today was our longest day of walking – this is because we decided to take a peek over the next bit (the San Antonio Pass) as the weather was nice. We set off at 8AM and it was a steady up, there are a few false summits but when you start to descend take care not to miss a path off to the right near a small field with lots of the weird cotton cactus before you reach the main bit of the large valley as the campsite is hidden behind a small hill. We missed it and it’s probably the only time we got “lost”. We arrived early enough to take a peek at the next bit as the weather was good. This is the San Antonio pass which is a walkers only route – in bad weather you follow the mules the flat(er) way around. There is an alternative to the San Antonio Pass which is every bit worthy of the three exclamation marks our map showed on the decent on the other side. Our plan was to walk a circular route over one pass and back using the other… as it turns out this might have been a little optimistic. 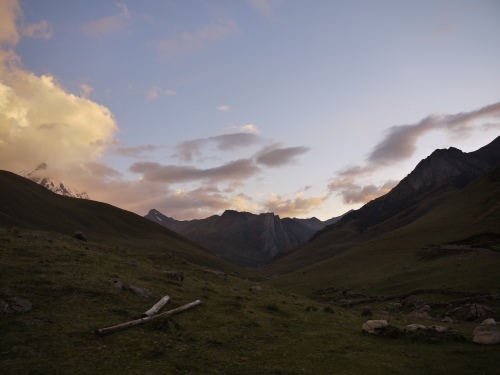 Our arriero said he thought the alternative path was further right than his sister who works as a proper guide for the family business (and had took us through the itinerary and drew on our map before we left) had said. He was wrong – if you’re looking for it then it runs parallel with the San Antonio – look to the right of the rounded mountain and you’ll just about see a stream you basically hike up that though there is a path to the right of it for some of the way which makes things easier to follow but stick to this stream. We decided to take the San Antonio and see what it was like to return the other way .. turns out it’s a fecking hard steep hike up to the 5030m (according to my GPS on my phone). It was a beautiful view up there over the lakes and Aguaucochi (sp? can’t read it on the map due to water damage!) near Cutatambi (spelling?) and the weather held for us. It looked a pretty sketchy descent – we decided to save ourselves for tomorrow (and take the alternative pass then). We woke up to niceish weather which allowed us to take on the other pass running parallel to the San Antonio – basically to find it there is a big rock to the left of the SA pass – head to the right of it and follow the small stream up the hill (we didn’t quite do this instead using the switchback path on the scree to the right of the stream but this ended in multiple side trails and we had to hike over to the stream) I suspect a combination of the two is the right way. Unfortunately the clouds rolled in so the view wasn’t as good for us as the day before but there was certainly at lot less steep uphill this way though we reckon the SA pass had the most impressive view (biased possibly by the cloudy conditions?). 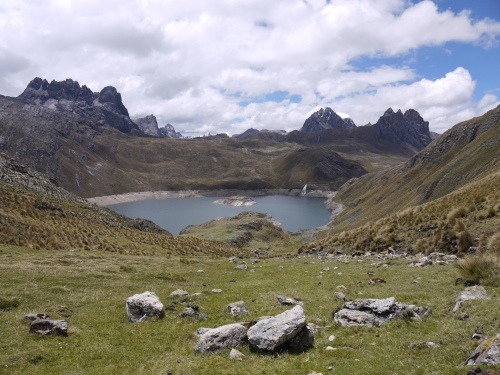 After climbing to the top you head right for about an hour of winding route – you should drop down to the right side of lake Jurayucochal (sp? the map fold obscures the name a little!) before the glaciers but the route wasn’t massively clear (though there are some cairns to help you down). We left behind the Claro satellite TV dish clad houses and delinquent children and headed back up the track to take the turning up a *very* steep hill that lasts about 2 hours. The sun was beating down on us and there seems to be an attempt to put a road in which might be complete soon? 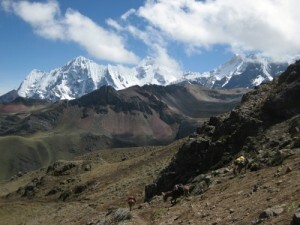 We started out at 3400m and the pass is at 4700m so it’s quite a hike. That night we slept at 4500m – the highest we slept at and not a very pleasant night as the campsite was windy and cold – so cold in fact that during the night the donkeys decided they’d had enough and continued on – after an hour of looking David finally found them close to the pass we’d take on that morning. This looked to be a very simple day – our “guide” pointed us at C. Huaerish peak on the left just after the pass and told us that this would be the best views of the trip. A simple up with a steep zig-zag down. Well he wasn’t wrong about the view (a cracking 360 view including Lakes Jahuacocha and Solteracacho and the over to the glacier on New. Jerishanca). but the route was a nightmare. He suggested we walk past the hill and cut back up – this was a stupidly steep uphill.. I think you’d be better heading left towards the peak after you come down off the pass. You can then walk along the ridge (I bet this is hairy in bad weather) and get to the view point. He said we could cut straight down from there – I have no idea how, it looked lethal. We decided (after staring at the map for a half hour) to go over the back and follow a dry river path down to Jahuachocha village, near the river, and walk the few kms along the road. I can’t say this was a complete success as there was no trail but we lived to tell the tale. I’d love to know the correct route (if there is one!). A stupidly early start without a cooked breakfast or any of the creature comforts we’d gotten used to! David suggest we walked the canal route rather than the locals walking route. This seems to avoid a big hill and give some views of the valley but does turn the last day in a rather dull plod. We arrived into town for the 11am bus to take us back to Huaraz for a well earned rest day. 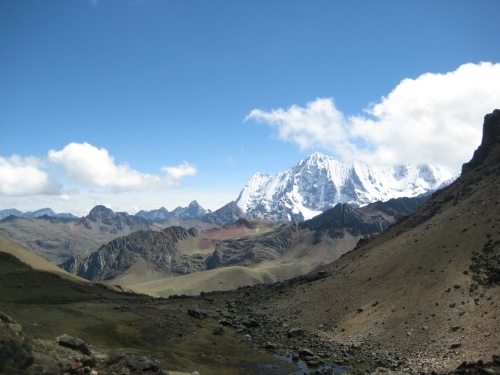 So would I recommend walking the Huayhuash in November? Well we didn’t see another tourist the whole way. If you have good waterproofs a sense of humour and man willing to lead your donkeys… absobloodyloutely! It’s stunningly beautiful – the only sad thing is that you will miss some of the views due to cloud but this just means I get to do it again one day in season! You need to purify your water on the trek.. we used a Steripen and I can’t recommend them highly enough.